This Sunday be prepared to be thrilled with a one of a kind exceptional theatre, an experience that will leave you asking for a re-run. The play dances around the working class, the petit bourgeoisie, the wannabes, the have-been-to, the very people who give Lagos its socio-economic bite. The characters are everywhere: the passengers and conductors on a molue; the distraught job seeker, a ‘paraga’ seller; and a greedy pastor who feeds fat on his impoverished congregation in the story, ‘The Sower and the Ravenous Wolf’. Venue: Terra Kulture, Tiamiyu Savage Street VI. 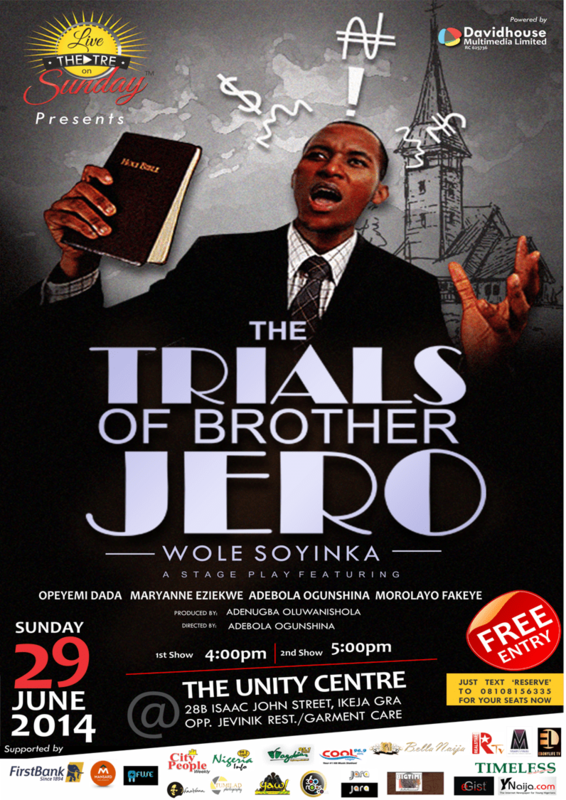 Repertory production continues this month with the presentation of Wole Soyinka’s timeless classic – The Trials of Brother Jero. The Trials of Brother is one part of the Jero plays collection, which also includes the Jero Metamorphosis. The Trials of Brother Jero first came out in 1964, while Jero’s Metamorphosis was published two years later in 1966. Both plays satirize Christianity and religious hypocrisy, particularly, the unquestioning devotion that many converts display towards their spiritual leaders, often exposing themselves to manipulation in the process. Directed by Adebola Ogunshina and produced by Adenugba Oluwanishola, the play features Opeyemi Dada (Scoundrel Suberu, Akanni and His Proposal) as Brother Jeroboam, alongside Adewale Kolawole (K-Blaq), MaryAnne Ezekwe, Morolayo Fakeye, Jumoke Adeniyi while Tunde Lawal is the Technical Director. The show holds on Sunday, June 29, 2014 at the New Unity Centre, (former Sandra’s Bar) 28, Isaac John Street, Ikeja GRA opposite Ruff n’ Tumble just before Metro Park by 4pm and 5pm respectively.